For well over a century, tales of “sliding stones” crept from the desolate floor of Death Valley into mainstream consciousness. 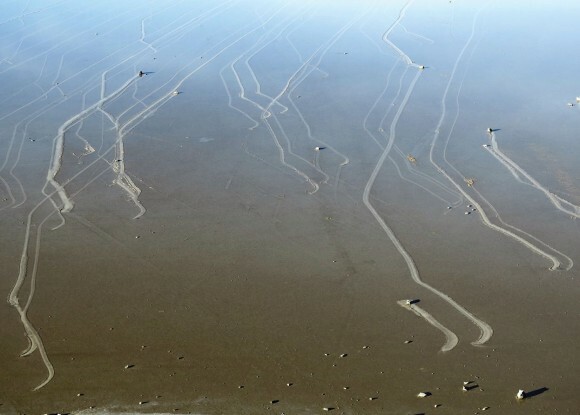 An area known as Racetrack Playa, is tattooed with cheeky testament to the phenomenon. Size, shape, and weight, seemingly inconsequential to movement – more baffling is that they only “move” every few years. Rough or flat bottomed stones tend to move in straight lines while smooth or rounded rocks wander about. Similar size and shaped rocks might travel beside each other for a time, then inexplicably go their own way. Death Valley has the lowest elevation in North America at 282 feet below sea level – surrounded by mountains, and only 84 miles from Mount Whitney, the highest elevation in the U.S. at 14,505 feet – Death Valley behaves like a natural convection oven. Vast areas void of vegetation adsorb sunlight, rising heat cools rapidly when climbing steep mountainous borders, forcing hot air into strong winds trapped within the valley perimeter. On July 10, 1913, Death Valley recorded the highest temperature recorded on Earth – 134 degrees Fahrenheit, or 57 Celsius. In 2011, cousins Richard D. and James M. Norris founded the Slithering Stones Research Initiative. With the help of NASA, and Scripps Institution of Oceanography they erected a weather station near Racetrack Playa – depositing 15 GPS fitted stones into the mix. On December 4 and 20, 2013 time lapse cameras recorded some of their GPS markers “moving” at up to 15 feet per minute. By January 2014, some marked rocks had traveled several hundred feet. They managed to record first ever visuals of stone movement, and solve the mystery. Stones “slithered” not from high winds, pressure exerted by frost heaves or being pushed along by winter ice – stones “floated” on thin sheets of window pane ice when a precise combination of moisture, morning sunlight and favorable winds aligned. “In contrast with previous hypotheses of powerful winds or thick ice floating rocks off the playa surface, the process of rock movement that we have observed occurs when the thin, 3- to 6-millimeter “windowpane” ice sheet covering the playa pool begins to melt in late morning sun and breaks up under light winds of ~4–5 meters/second. There had to be a perfectly reasonable explanation for this stunning exhibition of “nature works in mysterious ways”. Rather than kick myself for not laying eyes while in the vicinity – all I can do is pencil Death Valley onto my bucket list.